This listing is for one vibrant, high-quality poster print of the original artwork on premium paper stock. The printed image area is 10x13", centered on a sheet that is roughly 11x17". The watermark does not appear on the printed poster. The poster will arrive rolled into a sturdy 2x12" mailing tube so that it does not get creased or bent. 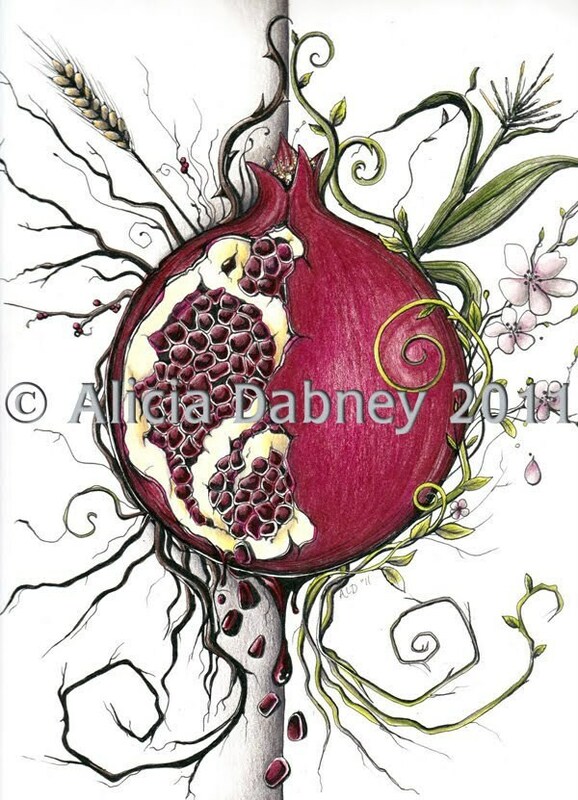 So much can be said about the myth of Persephone and the symbols contained within. Like many others, I have been fascinated by the story of Persephone for a very long time. As I grow and change, so do the symbols and meanings that I find within the myth. This piece is layered with meaning and personal significance. It draws from my personal thoughts and interpretations of the Eleusinian Mysteries via ritual theatre, The Hero with a Thousand Faces by Joseph Campbell, The Power of Myth by Joseph Campbell, Persephone Unveiled by Charles Stein, The Labyrinth by Catherine M. Valente, my role as a parent and mother, and the constant change and evolution within my personal life and creative work. "...while all stories have already been told, this is not a bad thing, since the retelling is still necessary. And while our own life's journey must always be ended alone, the travel is undertaken in the company not only of immediate loved ones and primal passion, but of the heroes and heroines—and myth-cycles—that have preceded us." Please see the "Shop Policies" section of my store for additional information on payments, shipping, gifts, and custom orders. © Elements & Artifacts 2014. Just beautiful! It is on the Persephone altar at this moment. Very unique. Thank you or quick mailing. Absolutely beautiful. Looks just like the picture. Arrived exactly when promised.